I think I need a new pedal board, & I hope someone can advise me on what to get. I'm pretty new to pedals really, I've usually just plugged straight into my amp before joining the current band. 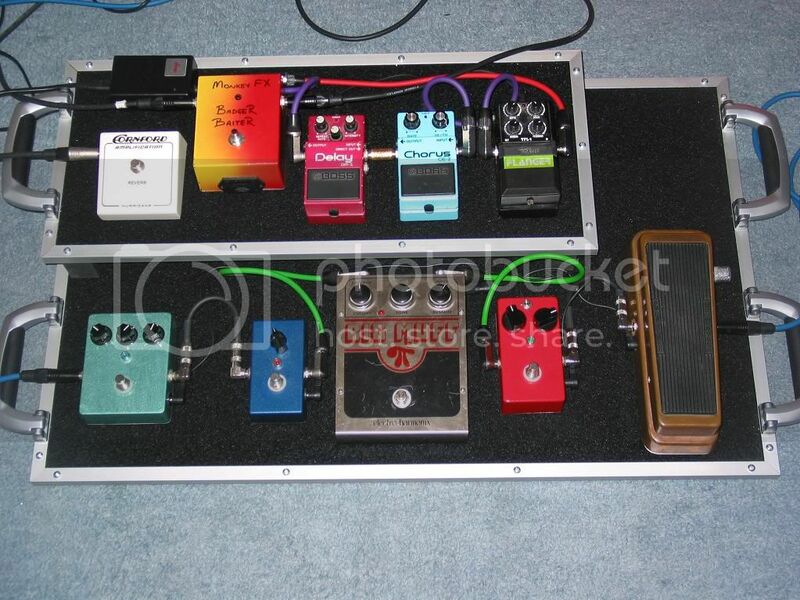 Pedals became a hassle to set up, so I got a Gator pedal board quite cheaply on eBay. but I found it was causing some noise. I assume that these all metal connectors are a bad idea as they don't allow for any movement of the pedals? Sorry for the crap pics, my camera has just died, so I'm relying on my phone till I get a new one. Anyway, can anyone suggest a decent, lightweight pedal board that will take 5 pedals, including a wah, and the power supply? I want to keep this simple - no bypass circuits or anything like that. I would prefer not to have a camoflage cover this time! But where does the power supply go? Interesting link to a homemade one. If I needed one I'd probably try something like this. There's even a link to his plan for the parts. I take it that you don't approve of pedals Marcus? Thanks for that link Dave. Unlike you, I'm not clever enough to make one myself (I remember what you did with that amp! ), but there are some useful tips on that link. Since I posted this a few days ago, the power supply has partially died, so it's just as well for tonight's gig that I bought a spare one a few months ago. Nah...just having a bit of a go with you. I actually do own a couple: Ibanez TS9 tube screamer, Dunlop Uni Vibe and an Electro - Harmonix Holy Grail Reverb. And I do use them - obviously for non Vibrato and non Reverb amps. I don't use the tube screamer much any more.....smaller amps give me the overdrive I need and I'm not going to tote in a Super Reverb to a small room and have to use a pedal to play it. I don't know why anyone bothers with commercial pedalboards. They are so easy and cheap to make yourself to your exact specs. Laptop carrier bags, old briefcases, a plank with fabric stapled to it... Once you've got a flat surface and a way to attach your pedals the only limit is your imagination. And the metal connector has no noise issues at all! It is a bit of a pain to move the connected pedals but once they're in place I've never really had to move them around anyway. Paladin2019 That's a very nice piece of work! I see one big problem with it though! That DM-3 should really be on my board! fancy selling it? Sorry dude, it's just too good to let go! Nice job Paladin, a bit beyond me though. I know I'm going to regret asking this, but what does a Badger Baiter do? Never mind the Badger Baiter, what about the ones with no writing on!! How does he know what they do?